The buckeye is the official state tree of Ohio and is native to that state as well. Buckeye trees grow up to 15 feet tall and 10 feet wide, with dark green leaves and an overall conical shape. The buckeye tree blooms with 12-inch-long red or yellow spike-like flowers in early summer, followed by glossy, dark-brown nuts that resemble deer eyes. Buckeye trees grow best in USDA Hardiness zones 5 through 8, withstanding winter temperatures as low as minus 20 degrees Fahrenheit. You can grow buckeye trees easily either by seed or by planting nursery-raised trees. Harvest the buckeye seeds by collecting them after they’ve fallen off the tree in September or early October and removing the seeds from their husks. You should plant the seed into the ground immediately after collecting it, so that the seed doesn’t dry out. 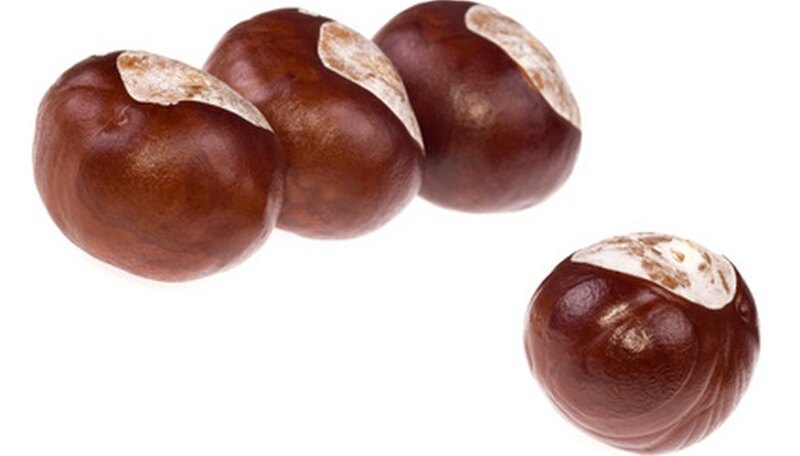 Select a site to plant your buckeye seeds that is in full to partial sunlight. Loosen the soil at the planting site to a depth of 6 to 12 inches using a rototiller or pitchfork. Plant the buckeye tree seeds about 3 inches deep into the soil. Plant about twice as many seeds as you’ll need because buckeye seeds usually have a 50-percent germination rate. Spread a 3-inch layer of straw mulch over the seed bed to protect the buckeye seeds during the winter. Remove the straw mulch from the seed bed in early spring, after the last frost. Water the seed bed once every three days to keep the soil evenly moistened. Cut back on watering the soil after the seeds germinate and begin to sprout, watering them only to supplement rainfall so that they receive about 1 inch of water each week. Feed the buckeye tree seedlings once each month during the growing season with a 10-10-10 NPK (nitrogen-phosphorous-potassium) fertilizer at half the normal dosage rate. Transplant the seedling buckeye trees to their permanent locations in the spring of their second year. Plant nursery-grown buckeye trees in early spring after the last frost. Dig a planting hole for your buckeye tree that is the same depth and width as the container or root ball. Remove the buckeye’s roots from the container or burlap and loosen them gently. Also remove any twine holding the roots together. Untangle the roots and spread them out in the planting hole. Backfill the planting hole with the displaced soil, planting the buckeye tree about 1 inch higher than it was planted in the container. Spread a 2-inch layer of bark mulch or composted wood chips around the base of the buckeye tree. Water the soil deeply to moisten it thoroughly around the root zone. Continue to water the buckeye tree deeply once each week, if rainfall is less than a half inch. Wait until the transplanted nursery tree is in its second growing season before applying a commercial fertilizer. Lay a mesh screen over the buckeye seeds and beneath the straw mulch during the winter to protect them from hungry squirrels. Stop watering and fertilizing the buckeye tree seedlings in mid-August to prepare them for the winter season. Don't pick the buckeye seed pods while they're still on the tree because these seeds are not yet mature. Wait until the seeds fall off the buckeye trees and collect them from the ground beneath the trees.